When I first tossed the digital representation of Back to the Woods into my digital representation of a stereo (a.k.a. iTunes)‚ it didn't take more than the opening notes of "Seen It All" for me to determine that I could really get into this band. The Brew tapped into something in my craggy funnel of musical appreciation. 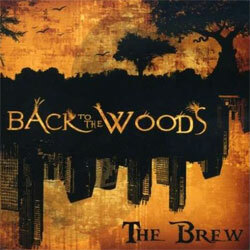 Part of it is the idea they communicate with the title track‚ "Back To The Woods." Nature‚ music‚ springtime. Those are good elements for a new sound‚ and this was my first exposure to the band‚ so a lot was riding on theme here. The music is well-crafted‚ and the songwriting marries both the traditional elements of rock with progressive risk-taking. The vocals are impressive‚ balancing layered harmonies with thought-provoking lyrics. It's a well-rounded sound that is fun yet also entreats you to sit back and have a little ponder. The Brew push boundaries but don't reach too far. They get it. At least‚ I hope they get it. Either that or they are the monkeys in the room with the typewriters (in this case instruments) replicating some great work of art. I'm pretty sure they're not the latter. Back to the woods. It is that time of year‚ isn't it?